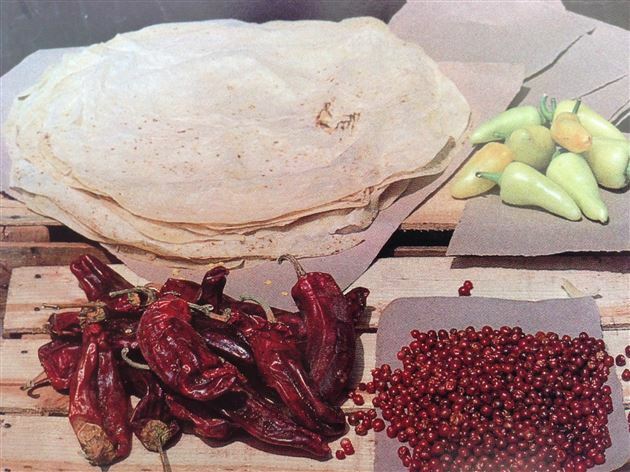 Tortillas are common throughout Mexico, but tortillas made from wheat flour are typical from Sonora. 1. Put flour in a glass mixing bowl. Add salt and vegetable shortening. Add water a little at a time and knead dough until it forms an elastic and shiny ball. 2. Set dough aside, covered with a damp cloth , for 30 minutes. 3. Pinch a small ball of dough, and place between 2 sheets of waxed paper. With a rolling pin , roll into a circle about 3 inches in diameter. The tortilla should be very thin. Pull edges with your fingertips, stretching the tortilla a little. 4. On a hot thick griddle, cook tortilla on each side for about 2 minutes or until light brown. The tortilla should puff slightly. 4. Repeat using all the dough. To serve: Place tortillas in a basket.